This morning I heard banging in my studio..I figured it was just Miss Pennythistle, but went to check it out anyway. I took my camera, as I thought to catch her in some malicious act, but instead captured a very surprised goblin !! Then,... just above him..I was able to photograph a very large Goblin before it was sucked completely into the wall!!! Ohhh my.. the strange things that go on in my studio!! I am working on a ball jointed piece for a class for Niada next year which I hope to show soon..but in the meantime, I thought I'd post some of my religious and wax pieces that give me inspiration! Of course the "Fairy Godmum" with the wonderful Bette head below! A wax musical Jesus baby with an old crech doll..the pics are dark as he is in an alcove in my bedroom and the pictures always show up dark. 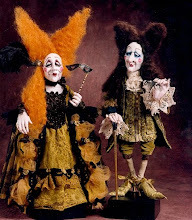 MoreWax dolls, in the same alcove which makes the pictures dark, sorry....but maybe, makes them more mysterious..they are resting on fabric from the 1700's. And when I wake in the morning this is the first site I see.! My Religious Alcove in the front room..., A wax madonna in the back and a wax fairy in the right hand corner. An 1800's carved wood babyJesus in front and a ceramic madonna behind with a repro crown. An old wax ex-voto head in the middle. In the back, is an old wax christ child from Italy..with an antique banner from france on the wall behind it all. These are some of the things that inspire me ..so hope they inspire you also! The Duirwaigh Gallery Walk through wonderland one- line show is now up! !http://duirwaighgallery.com/group_thumb_list_with_artist.php?section=180 Check it out! I have two pieces in the show..Mad Alice" and an original drawing/painting, Monsieur Rabbit . I think only the rabbit piece is still available. 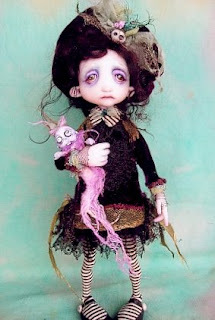 Check this out..sooo cool,.. dark, gothic victorian, strange, sideshow, ...and inspirational! ! Introducing "Monsieur Rabbit".. A mixed media original drawing/painting I did for For The Duirwaigh Gallery "Walk through Wonderland" show! In a previous "life before dolls" I used to paint and draw. Oil and water color, and pen & ink airbrush illustrations for a childrens book I was going to do..but, got sidetracked with the dolls and never looked back. Every once in a while though, I have the urge to pick up the pen/pencil/brush, again, and did so for this show. Monsieur Rabbit was drawn in graphite then colored with acrylics. I then mounted him on an old victorian red velvet album cover. I added a vintage plaster frame around him..an antique Skeleton key...(the one Alice uses to get into the garden..original,.. I'm sure!) Painted a striped background, and a pen drawn banner below him that says "Monsieur Rabbit" ..in case you forget who he is! I added a vintage black ribbon to hang the piece on in your own lovely little Wonderland cottage! I'm sure it once hung proudly in Monsieur Rabbits home......! You can own it when the Duirwaigh show gets underwaigh..er under way on the 27th..Monday! check it out..or the Queen just might have your head!..Yikes! Every so often I get together with my good friend and fellow artist Marilyn Radzat and we have a creativity retreat at her Magical Paradise home located on North Shore of Hawaii. We have so much fun at these retreats...Sometimes TOO much fun!! One night, at midnight, with a full moon out (..yeah..it was that darn full moon!) 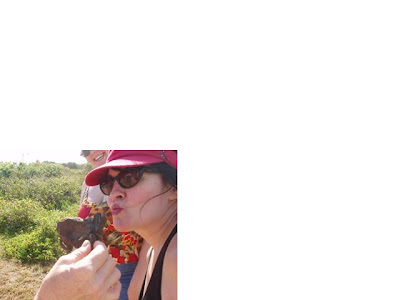 we all took a walk down the beach, where our friend Patricia impressed us with her famous Duck call!! Patricia does all the cooking for us at the reteats, and definatly adds a ton of fun! This is me..TRYING to imitate Patricias' famous duck call!.. I must say, I sounded more like a little squealing piglet, then Patricias Elequent ducky! Or maybe I was just more the rubber ducky!! I'll have to practice.... This takes a lot of creativity..believe me!! Me...after our midnight moonlight swim..duck calling contest... and a bit too much fun! There is a special path we take over to Marilyns secret "Sea Glass " beach. Sometimes we find the most unusual things!! Here someone found a poor dehydrated froggy! I'm sure there was a prince in there somwhere (a long time ago maybe!) just waiting for that magic kiss to be released.....Sorry Prince!..I just couldn't go through with it!! 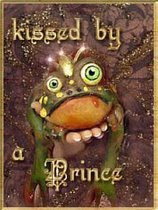 Come join us for our next retreat Sept 2009..and maybe you can find your own Frog Prince!! 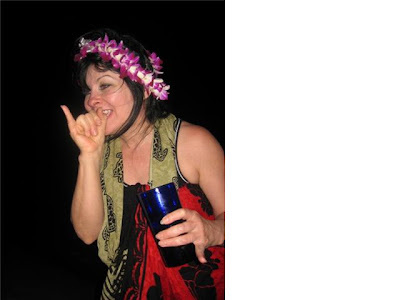 E-mail me at faeries16@hotmail.com or marilyn at ikons@hawaii.rr.com for info! I thought I'd show how I put Alice's theater box together for the Alice piece I did For the Duirwaigh gallery show. In all my piles of stuff I save, including some really cool old antique boxes,...I did not have one single box that was just the right size and shape I needed... Wouldn't ya know! But I did find a box that some ancient treasure I purchased from ebay came in. Now, how to make it cool and old looking. I reinforced the seams with archival linen hinging tape and attached the box to a wooden block..new problem the blocks not as wide as I like so have to solve that problem by later adding wooden trim moulding. Here I rounded out the corners to give it an arch shape using cardboard and linentape. Inside I cut watercolor paper that I glued in and then gave it all a good coat of Gesso to protect. (I really have no clue what I'm doing at this point and I'm beginning to wonder at my sanity!..Now WHY I'm I making this box???.!! Oh yeah..I think it will make the Alice piece much more interesting)!! I added pages from an old Alice book to the sides and back and aged it. I was planning on a black base but it all started getting to dark. So to lighten it up a bit I repainted the base a yummy sagey green.I added curtains made from an old masonic lodge collar. Then cut, gessoed and painted foamcore in an arch for the top.Sculpted a Cheshire puss face,painted the banner. Added the quote "Were All Mad Here"By this time I really did think I was mad!Thats it in a nutshell....but in actuality it took me about a week and a half to complete it.Drying time was some of it but, Mostly, due to the fact that I had no clue what I wanted! So it was a slow step by step process. Here is the finished Theater box..minus Alice....as Miss Pennythistle decided SHE should be the STAR of the show, and told Alice that she was due in court! GHOSTIE Book SpOOkY Sneek Peek! Okay...you ask for it so I'm giving you a little peek inside the book! Each book has an original ink drawing on the inside cover of my little Skeleton Baby Head! 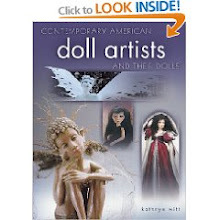 The book is 40 pages and has color photos of 18 of my Ghostie Dolls and the "Dark Whimsy" poems I wrote about their early demise. Spiral Bound 5 1/2"x 8 1/2" Limited to only 50 copies. Here is my finished piece for Duirwaigh Galleries "A Walk through Wonderland" show! Alice... who has been wondering in wonderland a bit too long... and her dolly "March Hare" who both have imbided in to much "tea" at the party and have gone a "bit mad here"!! Alice is free standing and 10" tall. The overall theater piece is 16" high by 7" wide. Alice's clothes are made from antique textiles and hand dyed lime green leather victorian shoes. Wild "mad" mohair wig, and hand painted pinkish/blue eyes. Hand made top hat complete with leather Rabbit ears! Her "Mad Wonderland Theater Box" was an after- thought... and, once I started it, I thought I was truly "mad" for coming up with the idea to do it !! Although, I think it greatly adds something to the piece, I had no idea of what I was doing, and it was like a bad "Twilight Zone movie that just went on and on and on........ the never ending story...no wait ..thats another movie!! I took photos of the creation of the "mad box" as I went along.... so keep watching and I'll be posting photos of the, "how I did it",... while I was still half sane!..or not..a matter of opinion! My Ghostie book is NOW Available! ! Fresh from the ghostly printers is my Ghostie Book! OOOAAAAHAAA!!! 40 pages, with photos of 18 of my little Victorian inspired Ghosties, and the poems I've written about their early demise. If you'd like a copy to haunt your mansion, Please e-mail me at faeries16@hotmail.com . Price in the US is $25.00 includes shipping. I have been experimenting with sculpting ball jointed dolls on and off for a while now, and thought I'd share some of the one's I've done. This is one of my favorites. My daughter thinks she looks stoned, but I really like her! Her wig is removable, and I have a blonde one I did for her also, but I like this dark one the best. Her eyes are not removable. Her ankles are ball jointed, but I've made her socks a bit to tight and they are a pain to remove so you'll have to take my word for it! She's about 13 1/2" tall, and sculpted from polymer clay. These are just some fabrics I've pinned on her to try and get an idea of how I will dress her. This poor thing doesn't have her hair yet.....and, she has a splitting headache! Literally!! I don't know if you can see it in the photo, but her little head is splitting from under her chin on her left side, and is slowly creeping up past her nose. A problem brought on by the tension of the stringing cord and probably a weak spot in the clay on that side of her face. This is a problem I'm finding with using polymer clay for the bjd's. She is about 9"
This one was the first ones I did. Her head is not jointed, and I've sewn the clothes on her so I can't remove them to show you her body. 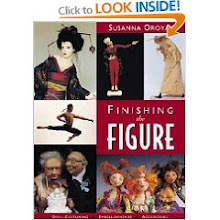 She measures 10"
I really love the poseability and being able to "play"with these jointed dolls. The majority of my dolls I make are free standing, and posed in one position, and this is so fun to be able to interact with them! I just wish there was a FASTER way to do them! It's definatly not instant gratification!!!!! Always, when I'm about half way done with one, I start wondering what the heck I was thinking as it feels like I'll never get finished! 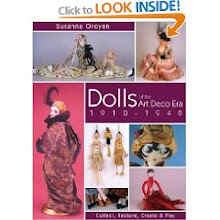 I just want to get done and see the finished doll! For me it's the costuming that I enjoy the most..and I'm VERY impatient! I call this piece "fairy funeral". 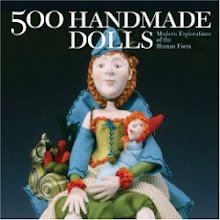 She started out to be a ball jointed doll. Her head is jointed but her arms are cotter pinned at the shoulders and her elbows are put together more like the old balinese puppets. By the time I got to her legs...I just couldn't stand it, and so her torso and legs are totally sculpted in one position. She has human hair and is 13 1/2"
If I get one really good body I like, I may just get it molded and then sculpt different heads for it.... in between all the other things I want to do.....aaahhh.. so many ideas and never enough time!! This is what happens to Cinderella when she does not listen to her FairyGodmother...and comes in after Midnight!! So Take Heed and mind your Fairy Godmother!!! 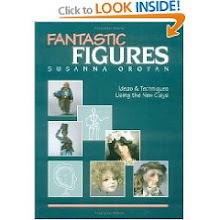 I've long had a facination with wax figures and dolls. I find them Haunting, Magical, and Mysterious..... Maybe it was that first trip to Madame Tussaud's, down a foggy London street when I was 16. I've been fortunate enough to collect a few wax heads. The head in front is a wax museum head of Shirley Temple, and my most favorite one is the head in back. A young Betty Davis when she first started out acting. She has glass eyes, porcelian teeth and inserted human hair. I got her from Crystal at Gothic Rose Antiques and curiosities. A most Spooktacular place for all things unusual! 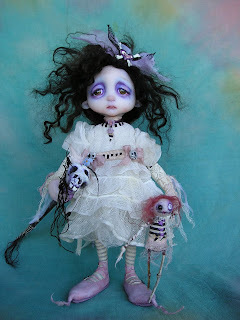 If you love Victorian gothic and the macabre check her out! You won't be dissapointed! The other small head I think must have been a department store display from the 20's A treasure found on ebay. Another wax head from a wax museum with inserted human hair eyebrows. This poor guy's lost part of his face. I've slowly been cleaning and repairing him He thinks he's Napolean, and I have't had the heart to tell him any different! From France I have two domed wax christ babes with inserted human hair. Probably late 1800's. It's rare to find the original domes still intact. A collection of my wax dolls (except for the one on the left). 1880's mostly from England. I've been playing around with creating wax dolls, and at some point want to create a wax fairy. I think that would be the perfect medium for a fairy..Haunting, translucent, and mysterious! Awhile back I began to hear noices coming from my studio, but when I'd go to look there was nothing there. Then, things started dissapearing, only to show up later in some other part of the house. Finally, one day I caught them! These strange little creatures frolicking among my stuff! (no wonder my studio is so messy)! The Fairy Godmum and Miss Pennythistle...who thinks shes Queen of everything she sees! Miss Pennythistle is really a little fairy that prefers to show herself to me in the form of a mousey like creature. She's amazing! She can hold perfectly still for hours on end without even twitching a muscle or blinking an eye! Then they started to multiply. Just like Gremlins! One day MissTinkeywillow showed up and they had a tugowar with the christmas tinsel. It took hours to get them untangled! They didn't play well together so I sent Miss Tinkeywillow off to bug someone else! Next to show up was Petunia Petootie.It was okay for awhile, but then the two of them started to become so annoying. 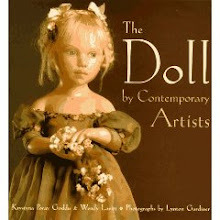 They would steal my paintbrushes and torment me by acting like they were going to paint on the dolls I was working on! They started to fight over toys...mostly because Miss Pennythistle thinks everything is hers. She does not play well with others!! SOOO Petunia Petootie went buh-by! Then Princess Poppyseed showed up. Well...you can imagine what Miss Pennythistle thought of that!!! Two princesses do not do well together! Soooo..I had to find a new home for Princess Poppyseed....then, I locked my doors and close the shades, and pretended to leave town! Angi has a special love for all things Alice as many of us do, and decided to do a special on line show dedicated to all things Alice in Wonderland!! Now she's an only child once again!! her dolly in tote, still waits for her mum at the boat" (Gosh..was it the titanic)?? And..Voilet Lark..the little ghostie that started it all! and was ate by a land shark"! Violet stand s just under 13" and her clothing was made using an antique decrepit maroon silk velvet and other "ageing" textiles. Her baby doll is just under 2 1/2" and wears the typically ghostly rotting & shredded gauze befitting a strange baby-doll. One of my favorites! Lucy Mcbee! At the time I think was just three..
Now she's known as Ghostie McBee!" 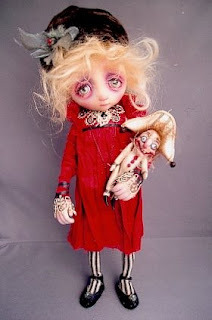 Lucy is just over 9" tall with rotting skeleton stick horse and creepy dolly..all the better to love them!